Not long ago, the photo of a little Syrian boy, who'd washed up dead on a European beach after drowning during the trip away from Syria went viral. It is very sad, indeed, and makes one reflect on the distress of these people fleeing their country at the risk of their lives. 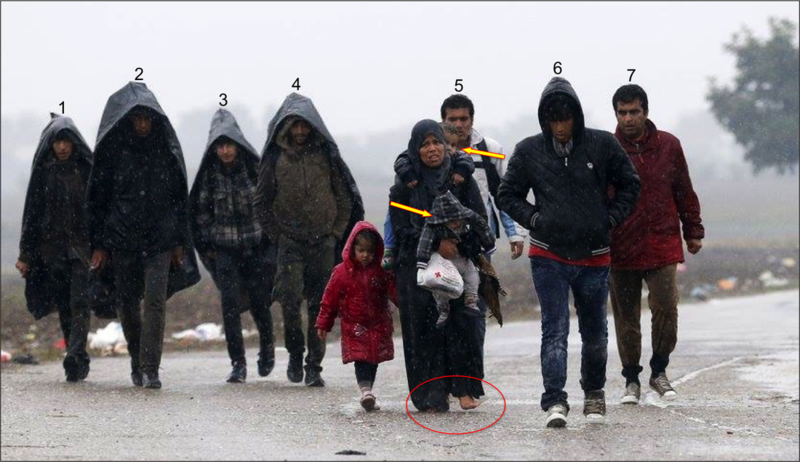 Now there is a new photo showing some people walking to reach the final objective of living in a European country. There are some startling realities that one might not pick up at first glance. Pay attention and you'll see there are seven men and one woman in the photo. Notice that the woman has no shoes, despite what appears to be cold, we weather? Also, note that the group includes children and that she is carrying two as she trudges down the road. That is, none of the men are helping her because in their culture, woman are property. She is only good to be a slave to the men.